I think we are living in a “floating exchange rate world,” in which we have lost visual control over what we might believe our assets and liabilities are “worth.” Value is hard to measure, and we Americans normally think about how many “dollars” each value might be. It is a yardstick. What is your house worth? How would you find out? Is that a “hard number” or just a guess? What would a Chinese person think about the price of your house, if they wanted to buy real estate in the United States? We can see if you went to Europe everything would seem about 6 percent more expensive, generally. We live in a floating exchange rate world, but “one dollar” is not like the “inch” on a yardstick, nor a “meter” in the SI. It is like rubber, and we know the dollar is shrinking continuously in value. The Fed says it is trying to diminish the value of dollars at 2% annually. So far their theory seems not to work very well. I believe the strong overseas demand for the USDollar is having a dominant effect; the USD as a unit of accounting, is strong as a safe haven, and because US Treasury bonds are payable in USD. What do they say at the end of some 1950s scary “invaders from Mars films? “Watch the skies.” The danger of another 2007-08 can come again, in this puzzling financial universe of Federal Reserve interest rates near Zero for more than 7 years and quantitative easing, seemingly not to very much effect. I claim the foreign exchange phenomenon explains much of the picture, but it could change very quickly. Watch the horizon for scary events. What if Donald Trump were sworn in as the 45th President of the United States in 2017? Thomas Hodgskin was a great classical liberal leader. His book has this quote about Social Order and the motivations of other polical “leaders” he knew in Parliament. His insights anticipated the Public Choice School of economists, who teach us to look to the behavioral motives of elected officials and their bureaucratic employees. His book: The Natural and Artificial Right of Property Contrasted (1832) was very important in the 1830s’ British debates about the proper role of government. He strongly opposed Jeremy Bentham’s and James Mill’s Utiliarianism, and he directly influenced Herbert Spencer. See George H. Smith’s series on this great classical liberal. Let’s take this complex quotation and break it into four segments of argument. What is “social order”? How does it arise peacefully? Social order occurs prior to the State and legislators. Legislation attempts to freeze out natural changes. The political meddling by politicians introduces social dis-order. 1. What is “social order”? Hodskin defines “social order” as a process F.A. Hayek would later describe as “spontaneous order.” It arises from the evolution of usage and successful experimentation just as all social customs evolve, as well as our common language. The bureaucrats and Parliamentarians who make regulations and laws are restrictive and seek “to regulate or preserve” the status quo for the benefit of vested, crony interests. The bureaucrat and the legislator cause more direct and indirect harm to the peaceful operation of social order than they intend. We can measure this in the rent-seeking costs of lobbyists and protectionists, and the expense of compliance with regulations. The meddling of the political “leader” is for the purpose of keeping himself and his peers in power. Whether this is a conscious “conspiracy” of political parties, or an indirect effect of making incentives for rent-seekers to work for protectionism, the results are the same for average people: lower standards of living. 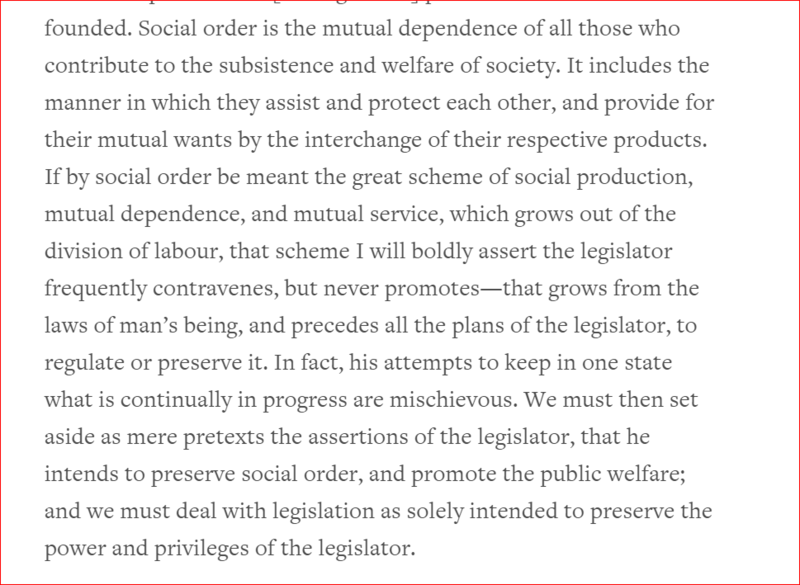 The model of “the legislator” in Thomas Hodgskin’s writing is Jeremy Bentham and his protege James Mill, who saw in mechanistic Utilitarianism the key to setting up a “designed,” positive-law utopian scheme for government. This Utilitarianism almost destroyed the classical liberal arguments for human rights and civil liberties in the early decades of the 19th century. Thomas Hodgskin and Herbert Spencer preserved the original, central argument for private property rights developed by John Locke on the premise of a peaceful “social order,” contrasted with the ideas of Thomas Hobbes (human lives are “nasty, brutish and short” due to warfare of “all against all” in nature). This discussion should now turn to John Locke’s innovation in his 1st and 2nd Treatise on Government. Who Sets the Minimum Wage? Debate in the political media about whether the Minimum Wage ought to be $15.00 per hour is silly. I italicized “minimum wage” above because we don’t know what that means, and we all believe we do. It has become “a Thing” instead of a price. The wages of labor are paid by employers who have work to do and need someone to do it. Sometimes the employers need workers who are smarter than their managers and other times they need workers who are not smarter. They reward the workers accordingly. Nobody can find anything wrong with that model of correct and moral behavior in the employer-employee relationship. Pay for work performed. Pay promptly. Pay in good “legal tender,” whatever that means. The idea that a government should create a law telling employers, or potential employers, they are forbidden to pay anyone less than a certain floor price for labor will find itself creating an artificial surplus of labor at the lower supply-curve range. Elementary price theory, long known to be valid. But what is “magical” about a Federal law? What is more logical about a local law? And what is most logical would be to let each employer decide for his own establishment what the starting or minimum (disliked) wage should be, as workers would want to increase it by demonstrating more quality and effort. December 17, 2015, will be the 30th anniversary of the signing into law of the American Eagle Gold Bullion Coin legislation, by Ronald Reagan. This is today Public Law 99-185 [31 USC 5112(a)(7…11),(i),(q) – and “legal tender” 5112(h)]. The law created a US Mint coinage based on troy ounces of fine gold. The denominations were $50.00 per ounce, $25/half, etc. Credit is due to Rep. Ron Paul (R-TX) who introduced the original legislation in the 98th Congress as H.R. 4226 (10/26/1983). It did not become law during his term in Congress. In the 99th Congress Rep. Jerry Lewis (R-CA) reintroduced the bill with co-sponsorship from Rep. Julian Dixon (D-CA), and Sen. James McClure introduced the Senate bills. President Ronald Reagan signed the law on December 17, 1985. The design artist, Miley Busieck, whose “family of eagles” was specified in the law, was instrumental as a visitor to each Congressional and Senator’s office with her sweet persuasion in favor of the gold coinage. This is the first legal tender relationship between the US Treasury and a weight of gold since the classic days before 1933. Member of Parliament. He is still a strong voice for free trade, as “best” British (and universal) commercial policy. He was able to win his government to free trade in 1846, with a half-century of strong economic growth to follow. This great idea, of the connection between free trade and peace, was urged at a time of a great delusion about “balance of power” and Russia. It sounds familiar to a 20-21st century observer. 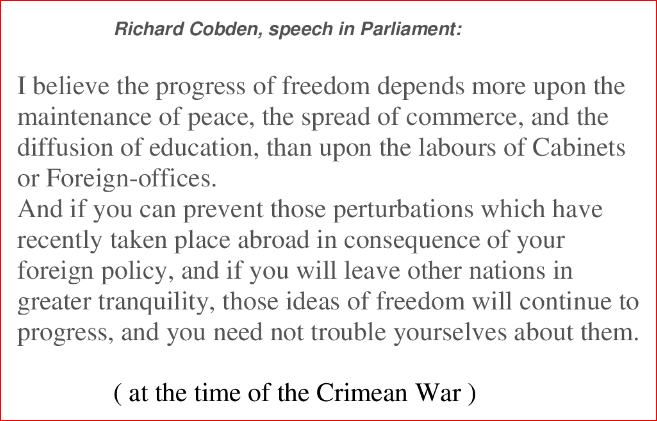 Cobden’s classical Liberal Party dominated the government during the following decades and Britain “ruled” the world in a period of great peace and prosperity. His 2nd greatest achievement was the Free Trade Treaty with France (1860), which became a model for many other such treaties that opened up other countries; Britain was not “closed” again until conservatives took the government and wanted to enhance “imperial preference” in trade. Then the Boer War and the first World War were indirect consequences of that new direction for commercial policies, as other governments followed Bismarck instead of Cobden. Wars historically come in years/decades following the closing off of an era of “free trade” as Britain enjoyed through the mid-19th century. The Trans-Pacific Partnership is just a continuation of what Reagan-Bush started with NAFTA and the Uruguary Round of the General Agreement on Tariffs and Trade (GATT), now renamed “World Trade Organization” (WTO). One criticism of TPP is “super courts” (arbitration panels). All those arbitration panels are the enforcement process, and the other criticism is all the “protections” for pharmaceutical patents and recorded music and films. But that is just US imperialism. It is just an extension of US domestic law. It is actually quite a crony capitalist demand by the US government, in favor of enriching some powerful vested interests in the United States, by requiring those other governments to arbitrate when ASCAP sues. Hollywood money? Those who favor TPP point out that it is “process” more than a Thing. The vote in Congress to approve it becomes a very technical and comprehensive package of amendments to existing US laws. For example, some 1930s law regulating pork might have to be changed due to some way it held up selling Vietnamese pork products in the US market; the Vietnam government demanded it, to help Vietnamese pork exporters. The Congressional vote to accept TPP cannot be “amended” just to give a reversal-vote for the US pork producers, who themselves have been enjoying protectionism since the 1930s – even if the pork producers have bought every Congressman. Always Remember: Trade treaties are always “trade off” negotiations. Each side gives up something. In trade treaties, each side agrees to stop punishing its own people. That is considered “giving up something” in mercantilist economics. We all agree the “best of all possible worlds” would be Universal free trade, no barriers and every merchant and retail distribution system should honor “national treatment” of foreign goods’ imports and foreign service providers (e.g. doctors, lawyers, architects, financial services). a more level and uniform “playing field” for international trade in services and intellectual property. Those, after all, are what the United States increasingly now exports to the rest of the world. The Economic Truth of any agreement like the TPP is that Some Americans will LOSE, just as Some Asian or other government-protected interests will be traded away (sacrificed) by their own governments. On both sides, there are losers, as well as many more diffusely widespread and a greater number of [smaller amount] winners over the years of future growth and division of labor. Normal people think it is good to have future growth and division of labor, and could call it “Progressive,” but Union officials in particular and economically illiterate “socialist” partisans will oppose all open international trade if buyers might be given a free choice without paying a penalty tax. The system of of the TPP (and the WTO and NAFTA) is to enact “norms” of equal treatment for all persons who trade inside a member country. It is called “national treatment.” It is what we have enjoyed inside the USA since before 1776. More free trade is about Larger, more extensive markets and greater division of labor. Restricted trade is about Smaller markets and more special protections for political groups, crony capitalists, and payoff for politicians (without whom, the smaller market could never be enforced).